Humor me and pretend it's the end of June. Index-Card-A-Day 2013 is still going strong. It's week 4 (June 23-29) and I finally feel more like myself again after surgery. It's back to some serious art time. 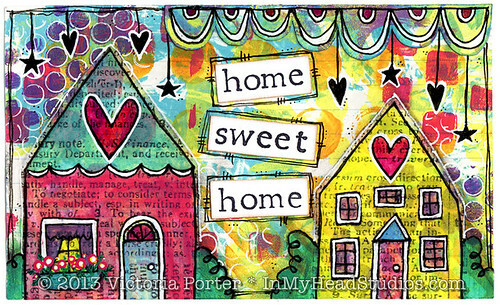 "Home Sweet Home" 6-23-13: This card began as a Gelli™ printed background. I glued down two pieces of printed tissue paper for the houses and painted over them. The scallops at the top are also Gelli™ printed and came from another project they just weren't working with well. I added a lot of detail with my gel pens. This is one of my favorite cards. "What A Wonderful World" 6-24-13 : The background started with gesso etched with some texture. I added some grungy paint techniques and splattered paint on it. The torn paper roses are from old book pages, some in English, French, and Japanese. I lightly edged them with a pink pigment ink pad. The leaves are cut from my Gelli™ printed paper stash, which is ever growing. 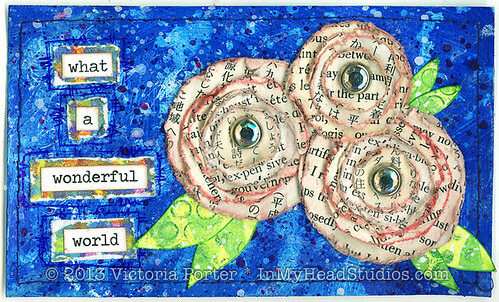 "Lyric" was one of the week's prompts so I went with one I could make with those Tim Holtz chit chat stickers. Each word has a Gelli™ printed background, which I distressed with my craft knife. The shiny rhinestone brads look funny in this scanned image of the card - but trust me - they shiiiiiiine. In order to tie the card together more I added stitching around the outside. "Owl" 6-25-13 : Guess what?! It's another Gelli™ printed background! 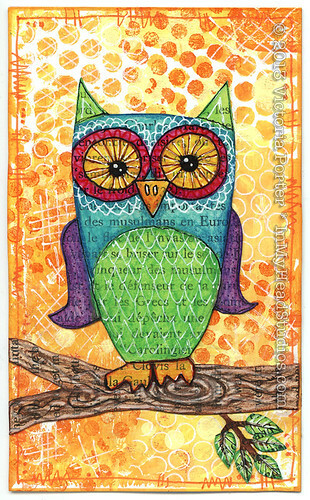 The owl is on very vintage French text paper. It was fragile so I glued it to a bit of thicker cardstock in order to draw on it. The owl consists of paint, marker, colored pencil, and gel pen. I drew the tree branch and the little stem with leaves, cut them out, and collaged them to the card. Then I cut the owl out and glued it on. A bit of a doodle around the edge completed it. "Roses" 6-26-13 : These roses are more of a complex paper layering design than can really be seen in this image. 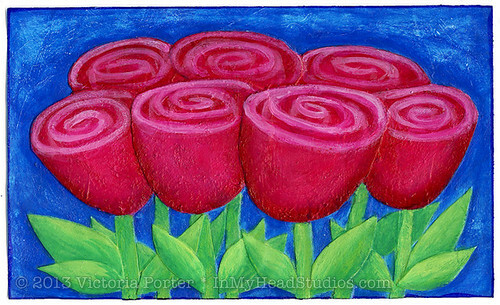 There are five paper layers: one for all seven flowers, one for the middle back rose, another for all four in front, one for the middle left front rose and one for the middle right front rose. Except for the last top layer, each layer was made to include the flowers that would be layered above it in order to avoid the lines that happen when overlapping this many layers. I got lazy with the last roses - the ones in the front middle - and you can see the line from where they overlap. All the leaves and stems were cut separately and put back together creating a lot more layers. The image was painted only after all the paper layers were complete. 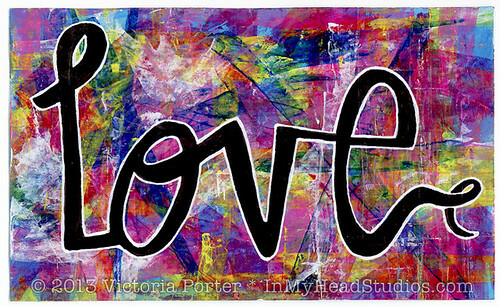 "Love" 6-27-13 : Not being one who likes to waste paint, this card was painted with left overs from another piece. I dragged the paint across the card with an old credit card. The word is drawn with a big brush shaped Sharpie™ and outlined with a white gel pen. "Time Flies" 6-28-13 : It's another Gelli™ printed background! I disliked the left side of the print so I collaged a piece of Gelli™ printed junk mail over it. 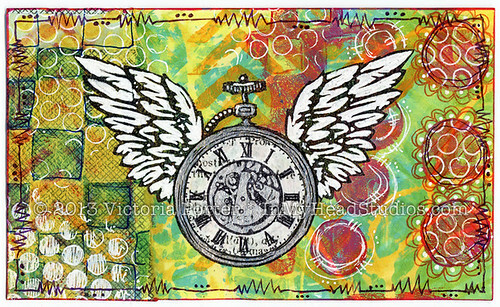 The wings and clock are stamped on tissue paper and collaged to the card. I added white and shiny silver gel pen to the stamped image. The little doodles were added last. "Not All Who Wander Are Lost" 6-29-13 : The background is torn paper from old books and acrylic paint. 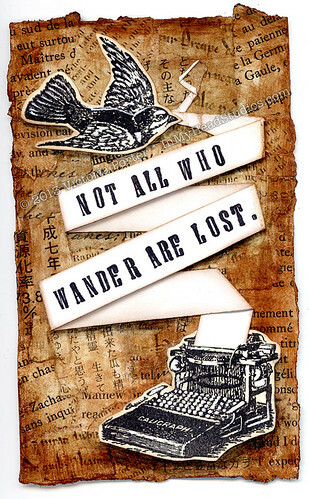 I stamped the typewriter and bird on tan paper and cut them out. Then I had to engineer the paper banner coming from the typewriter. It's all one piece of folded paper. Stamping the lettering was nerve wracking as I had one chance to get it right or I had to make the banner all over again. Nailed it on my second try. A slit cut in the typewriter allowed me to tuck the end of the banner in it. I used foam tape under the parts of the banner that have words. Those shadows you see are real, not digitally added. Sweet! If you click on the images of my index cards, you will go to flickr where they can be seen much larger. Check out the Daisy Yellow Index-Card-A-Day flickr group while you're there! I love the owl. He is too cute and such amazing colors!! !